2-income American families are putting in longer hours than ever before to fulfill the American Dream. The typical two-income family with children has seen income rise in the past 35 years, but not because hourly earnings have increased. Rather, it’s because of lengthening work schedules and women joining the labor force. 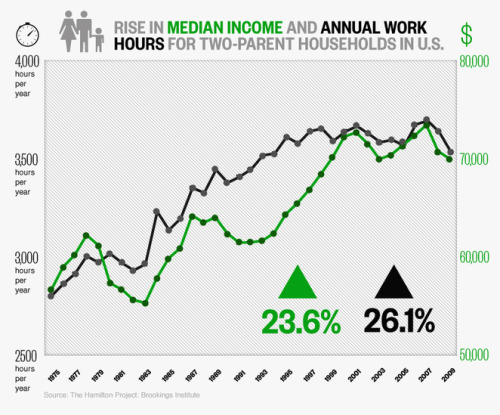 Since 1975, median wages for two-parent homes have increased by 23 percent. But over that same period, the working hours of parents grew by 26 percent, largely because of women taking jobs outside the home. The findings are in a recent study by the Brookings Institution’s Hamilton Project, which measures workplace and economic concerns.